Good morning from Austria. Today I like to reveal our plans here on steemit as pre announcment. Why? At the moment media is full of bad (and most of the time badly written) blockchain articles. For me as a private person it feels like I am doing so many great things with blockchain technology on the one hand, but opening the newspaper and reading the articles it feels like I am doing something bad on the other hand. So I decided to talk here about what we are going to do on the blockchain the next weeks, months but I guess years as center for applied game studies at Donau Universität Krems. Most of the plans are already in preparation for about 6-8 month. However the last weeks involved a lot of conceptional development, telephone and skype conferences and meetings. It was pure stress and I like to thank the whole team - Natalie, Karin, Thomas, Martin, Manuel, Simon, Ivan and Nikolaus for their help and time effort. Everything is settled via handshake, however as we are a public university making all the contracts might take some weeks. Nevertheless, we are a powerful team and start more or less right away. I will post the official press-announcements as soon as the contracts are signed (as said before several weeks). I will keep you updated here on steem project by project. (at the time milestones are achieve I don't set myself under pressure ;) ). After everything is 100 % official I will name more partners that are involved at the various projects. For now I will just mention "Center for Applied Game Studies, Donau Universität Krems" and the blockchain technology we will use for each project. The reason is very simple. I can speak about my plans freely but I don't like to reveal any partners before the ink is dry ;). And as we talk on a daily basis with Jelurida and Synereo at the moment I am 100 % sure about doing the following "proof of concepts". As long as the contracts are not signed I call everything in this article "Projectidea"
(we get a new website in december, just saying but for a first impression ;) ). Donau Universität Krems has several thousand Master Students. We offer MBA, MA, MSc and LL.M. Master Classes. Leisure-, Entertainment and Gaming Business Management. At this program we host the first two semesters, after that you can go for an MBA at our Business School, which is the #1 Business School in Austria offering MBA Programs. (See 2016 ranking here: https://industriemagazin.at/a/osterreichs-beste-mba-anbieter). We are very proud about this new possibility for our students. Besides our Master Programs the center for applied game studies is successfully conducting R&D projects. The recent years we were involved in 20+ R&D projects in different roles. From leading the project up to consultant roles. The projects were funded by private entities, the Austrian Government and the European Union. With our Games, Apps, Plattforms, Prototypes combing games with fields like education, marketing, HR/Recruiting or health we won several national and international awards. If you want to know more about those project - pls comment and I will start articles about our non-blockchain projects and "post mortems" of old projects. why blockchain? And how I decided about the technology we are going to use. I am into blockchain research since 2014 and my first talks have been about Game-Crime and Bitcoin. So as you see I started "on the bad side" - and that is why I partly understand how people talk about blockchain that just get in touch with it now. However I discovered (and this took me 2 1/2 years! omg!) that the real power of blockchain is not money-transfers it is building applications onto it, or better said application using for "special-tasks" blockchain technology embedded. Having this in mind a new horizon opened for me and I feel like coding my first website back in 1995 and my first MySQL CMS System in 1998. I also believe that speaking about nudging and gamification - or from an eagles perspective "us living in a ludologic society" - blockchain is the key element, the clue that connects everything. The power (in the backround) of establishing meaningful and longlasting ecosystems. However for the projects that I will start telling you in the next paragraph I needed Natalie, who showed me the power of Ethereum at the beginning of this year. Doing my research for several month I switched all my developing plans first from Ethereum to Ethereum Classic and finally decided several weeks ago to fully go on nxt and later ardor for my plans regarding setting up new ecosystems. I also tested waves in the meantime, but for me very personally solutions provided by Jelurida suit best. I am sure at this point that Ardor will have the same impact on the blockchain as Wordpress had for the internet and blogging. However other systems have the right to be used and will not only survive but perform well. As also for bloggers there is so much more than just wordpress. So if Ardor is wordpress, Waves is Joomla, Ethereum Classic is Contao, Ethereum might be Typo3, NEM could be Trupal and Lisk Redaxo :). I also decided to work with Ardor and Nxt for a very simple personal reason. I am economist, social scientist, game designer and conceptional developer. I am not! a "real" technican. Working with Ardor gives me the chance to understand most of the stuff the tech people are doing with it and it enables me to chance things and not crashing the system. All Austrian Townships run their own website, host them at private partners and issue their announcements by themselves. Most of the websites are hosted at private hosting companies. Some of the township websites are state of the art and already using https protocols. However most of the websites are a bit old fashioned. Townhalls upload their announcements to a public ledger. A blockchain based database. Townhalls can easily implement the data (PDF e.g.) into their own website, but besides that data is stored unhackable and immutable. Another positive aspect will be that this documents will be available on an independend - easy to use - townhall announcement search engine that crawls the blockchain entries. Townhall executives will use the digital citizenship signature to log-in into the system. Our proof-of-concept will combine digital citizenship technology provided by the gov. nd blockchain technology as trusted "database" and "hub" for public announcements. This project is not discriminating Austrian Townships and will not reduce their independence regarding the creation of their websites or where to host them. This project simply provides a helpful solution for the problems mentioned above and townships will not be forced to use this new technology. However mechanics based on our 13 yrs experience in gamification and nudging will motivate Townships to use our system as using it is a win-win solution. and can easily implement the links to them into the webpage they already host. Even if their webpage is old, privately hosted and not using https protocols the announcements themselves are safe, secure, easy to find and building a long-term storage. The project is not discriminating self-control, nor forcing Townships it is a easy to use little helper. Citizens on the other hand finally can find announcements going on the "hub" webpage connecting all township announcements or going to the webpage of the township, as they are used to do for years. Setting up the technology, setting up the hub, working together with a limited number of townships for the start. Inviting township by township to join. If the concept works (and for that we do not make a specific time frame, it works the time it is ready) we open it for every township in Austria. The last step - thus - needs of course additional funding. Exploring the usage of blockchain technology for governmental (and e-gov) usage. Researching the acceptance of this new technology within the township executives. Researching the acceptance of this technology for the Austrian citizens. Projectidea (B): Setting up a self running eco system for esports or furthermore for "waking up" abandoned games. We have plans to work with a well known esport brand that has been shut down in 2016. The proposal is at the moment reviewed by the board of directors. Plan (B) is building a competitive game with the students and using this simply for having a proof of concept. We already have a game for Plan (B) in mind ;) - so the project as proof of concept and inviting players to join is rdy to go. Tokens always have a fixed price to equivalent of x US $ to BTC/LTC et. Al. at moment of trade. Token sale is „first in first“ out on the market. There is much more material already existing for this project. I decided to provide here the key elements showing you what this game-economy-engine project will be all about. The name is the program. We wonder why it does not exist yet. It will be a combination about a classic "stock exchange game" with game based learning elements. 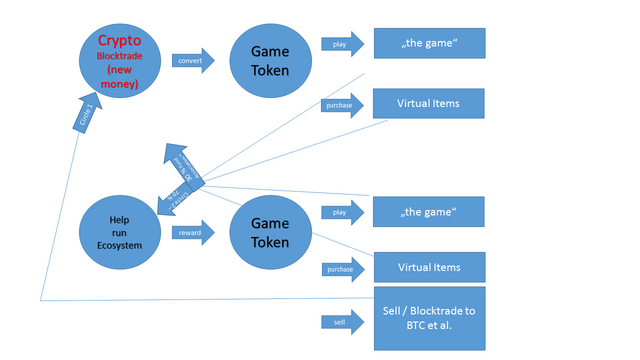 The player receives digital tokens and can "buy" "simulated crypto assets - based on the real ones". This is a non-commercial product. Simply trying to show the mechanics of trading, introducing the top 200 blockchain assets combining it with gamification and elearning tools. Something like that is absolutely missing. Hopefully played by a lot of people to learn more about blockchain. How can we reward sports objectively? This is about the combination of sport-trackers and blockchain-based tokens. With the tokens you can redeem goods that help you stay even healthier. This project is of high interest - lets say for the ministry of health or public health insurance. A system like this helping the citizens to stay healthy even if the running of the system and donating and paying for the "prizes" cost money it is much cheaper than paying the costs for unhealthy behavior. Projectidea (E): Building a system for video-competitions regarding a certain topic. The system can be a easy-to-set-up tool for companies and societies or schools/universities that like to run such a competition. It is like a small version of wildspark.me but enabling competitors to enter a description and a account as competitor. "Super-Fans" are selected experts from the specific field of the contest receiving a much higher amount of amps to vote (provided by the operator of the contest). The contest-starts on a specific timestamp. So even videos that have already been "amped" can compete as at the challenge plattform the amps within the timeframe count. However amped at our tool the maps of course count for the total amount of amps at wildspark.me. Imagine a major record label that likes to cast new bands and that likes to find out who has a nice fanbase already. A supermarket chain that like to run a fun-contest about "baking a cake" videos. A Tech-Company starting a contest using "device XY" for videos "about XY"
got it? unbelievable potention for marketing and scouting. Like to meet Team-Synereo in Austria? Come to www.frogvienna.at - Andy McCutcheson is our special guest at the conference dinner on the 14th of october. To have the "trio" ready we like to connect with LTC and think about the future of crypto as payment. We have really a basket full of ideas especially regarding the easy implentation to existing web shop systems like Magenta. However besides some informal e-mails the last point of the article just shows our intention to work with Litecoin officals as 3rd "column" on our "Blockchain Initiative from the center of applied game studies, Donau Universität Krems". My private project is here on steemit! Please have a look at www.steemit.com/@charityproject . If you have a steem account already it would be great if you can follow us and upvote our articles posted there. We like to buy computers for a school in Tirol - Brasil only using the power of Crypto. I think this is positive news. So I ask you to help to spread the word. Totally would like to support your project..
Great project. totally support this project. very useful and valuable information. MinnowsPower listed your post "My official - inoffical - announcement :): Donau Universität Krems - Center for applied game studies - and Blockchain Cooperations with Jelurida (nxt/ardor) and Synereo (AMPS)" as one of the top 20 posts of the day...!!! Announcement of a powerful concept and wish for the success. thanks for sharing that complete overview! @alexpfeiffer - oh my goodness, Sir you are planning applications embedded to block chain technology. impressive idea Sir. Love to support your works Sir. Therefore, I wish to ReSteem your post. I have just went through an OMG article :D A full of technical stuffs which are very suitable to build on block chain technologies! "application using for "special-tasks" blockchain technology embedded." This is really fantastic! And nice to meet someone like you here. Yeah, I did my master level at Sri Lanka and doing IT related job. So most of the technologies that you have mentioned here is well suited to build on Block chain technology! Interesting to read those things and if i could I will give my help too! Wish you all the best for up coming projects based on block chain technology! Yep, I am still trying to understand this block chain technology! Problem is i have no research team so far :/ Hope you can do it well and I will provide my best support too! Wow! Das klingt aber toll! I got some great enthusiastic feeling by reading your post, and yes i do not forget to upvote and resteem your post straight way as i want to show many steemians to follow the charity program . Upvoted and Resteemed as well. thanks@alexpfeiffer, its good article and nice project, always be supported. It sounds like a lot of ideas, but the implementation still needs to be proved... So do you work for Donau Universität Krems? They don't have an own crypto token do they? I am head of the center for applied game studies - yes I work there. And our center is not the only working working on crypto projects but every department has to communicate for themselves :).